Join us on September 21st, 2018 for National PARK(ing) Day! The event will be in downtown Daytona Beach on the Beach Street in a collaborative effort between the City, downtown redeveloper Jack White Land Co., engineering and planning firm LTG, Inc., the Surf Coast Chapter of the Florida Planning and Zoning Association (FPZA), and the Atlantic Coast Section of American Planning Association (APA). There will be a series of Parklet installations outside your favorite Beach Street restaurants and shops with activities for all ages. What are Parklets and what is Park(ing) Day? PARK(ing) Day is an annual event that encourages community members, students, and designers to transform metered parking spaces into temporary parklets. The concept started in a parking space in San Francisco. A few friends staged an impromptu park installation with a lawn, tree, park bench, and fence; maintained by feeding quarters into the meter. Essentially, a Parklet is an extension of the sidewalk into on-street parking spaces to create more people-oriented places. This is often done by introducing seating, planting, bicycle parking, or other elements of play and activity. The goal is to improve public spaces by adding opportunities for people to interact more with their surrounding community, and to reinvent our often vehicle-oriented cities. 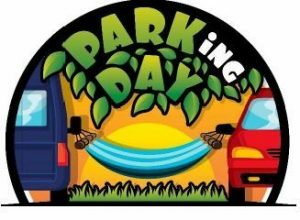 National PARK(ing) Day celebrates this through an annual event in which community members, businesses, students, and designers are encouraged to be as creative as possible in transforming on-street parking spaces into temporary parklets. Join us from 11 AM to 5 PM to learn about parklets, trending urban design techniques, community revitalization projects, and to experience Daytona Beach’s PARK(ing) Day!